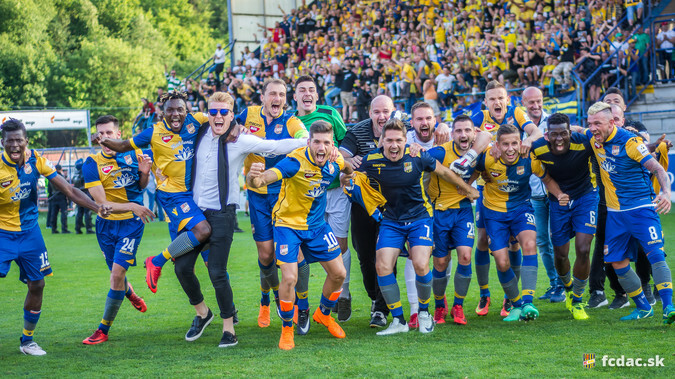 DAC 1904 Dunajska Streda has achieved a historical success – qualification into Europe league and bronze medal after 25 years. Players consider mental preparation as one of the keys towards it. “With every session of mental training we have become more coherent. I think, that mental preparation is also the reason why we are in Europe league. I felt it the most in the last game when I realized that even though it was now-or-never game after three loses, I was calm, confident and positive.” says Tomas Huk, one of the most reliable defenders in DAC. Mental training in Slovak professional sport is rare rather than a standard. “Nowadays sports are filled with high-quality technology that minimalizes physical and technical differences between players. What makes a difference between winners and losers today is their mind – how to focus in key moments or how to stay confident after bad performances.” Zuzana Psenakova from SportMind HDTS explains (worked as a mental coach of DAC 1904 Dunajska Streda during the second half of Fortuna league 2017/2018). “It is a young team with many ambitious players full of energy and desire to become better. Our goal was to use that to reach the aim. We often discussed the importance of cooperation, communication or concentration with players. I think that the players created a team with a great “sport heart” and they showed it in their performances in last games. Despite the adverse score they were fighting until the last second. In the last and the most important game, they proved that the bronze medal and Europe league was well deserved.” Psenakova says.